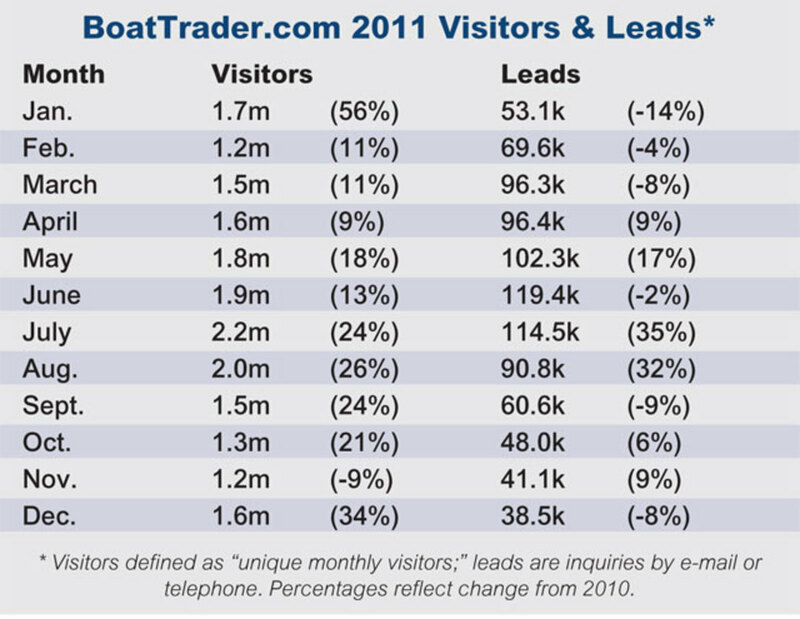 This month we look at two year-end statistics from BoatTrader.com and compare them with 2010 numbers to see what we can learn about the boat market. First, we look at how many unique visitors arrived at the site each month. Second, we report on the number of leads they sent to sellers who had boats listed at the site. During 2011 — in all months but November — the first report shows higher numbers of visitors, compared with the corresponding month in the previous year. Usually there was a double-digit monthly increase, and during the busy summer months the increase was above 20 percent. In December, there was also a big surge in traffic. The total number of visits for the year was 19.38 million. The numbers of leads visitors sent to brokers tell a different story. In half of the months the number increased, and in half it decreased. Total leads for the year were about 931,000, higher than 2010 by less than a percentage point. Although we’d like to see more people making serious inquiries about boats for sale, we believe the underlying story in these numbers reflects rising interest in boats and boating. Measures of consumer confidence and unemployment slowly have improved, and if that trend continues it seems likely that more potential buyers will begin to seriously pursue the boats they’ve been studying.